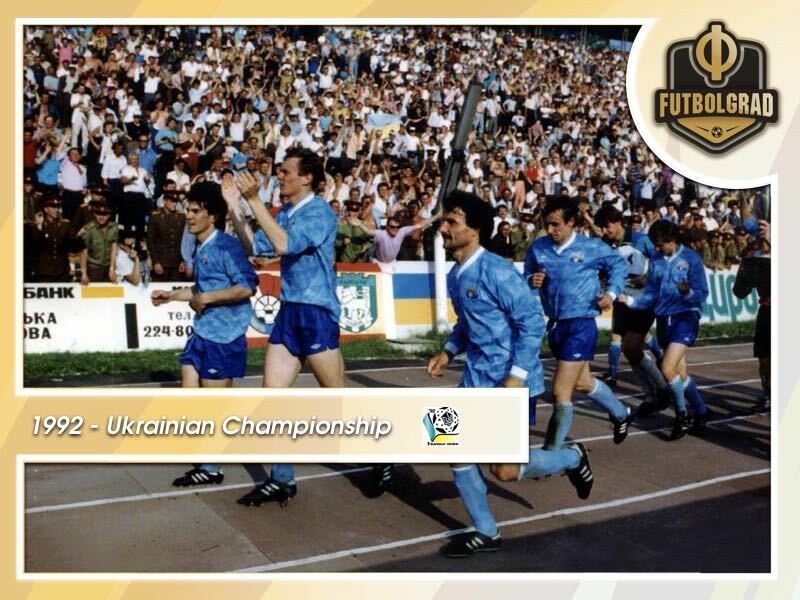 In 1991 the Soviet Union collapsed and one year later Tavriya Simferopol were crowned the first ever champions of an independent Ukrainian league. As the Soviet Union began to show signs of collapse, its domestic football followed suit. Between March and May of 1990, the three Baltic states of Estonia, Latvia, and Lithuania all declared independence. Anti-Soviet demonstrations in Tbilisi, Georgia on April 9 were violently dispersed, resulting in 21 deaths and hundreds of injuries. That same year Žalgiris of Vilnius, Dinamo Tbilisi, and most other clubs from these countries withdrew from the Soviet league system. Dynamo Kyiv won the league for a record 13th time. The following season CSKA Moscow conquered their seventh title, but 1991 would be the last year of the existence of both the Soviet Union and the Soviet Top League. Ukraine declared independence on 24 August, and in December 90% of Ukrainians voted for independence in a referendum. This signalled the death knell for the empire. The remaining teams defected to form their own domestic leagues. In Ukraine, football officials immediately organised a domestic campaign that would last just four months in order to align the schedule with the vast majority of European leagues. Moreover, the league had to finish before 25 June so that Ukrainian clubs could enter UEFA competitions for the 1992/93 season. The Soviet league operated on a March to November schedule, which left Soviet clubs at a disadvantage when they entered the European knockout stages at the beginning of their domestic season. Ukraine sought to avoid this concern. However, not all Ukrainian teams supported breaking away from the Soviet Union. Continuing in a sort of ‘United League’ even if Ukraine itself declared independence would have been more popular and profitable. Only Dynamo Kyiv were categorically in favour of an independent league, while Metalurh Donetsk wholly opposed the idea. Metalist Kharkiv took a clever middle position: if they remained in the Soviet Top league, they would be opposed, but if they got relegated, they would be in favour. In the end, Metalist finished in the relegation zone and adopted the ‘patriotic position.’ Dnipro manager Yevhen Kucherevksyi also came out against the idea. But the formation of a united league with Russia proved politically unpalatable, and an independent Ukrainian league was formed. The number one question was how to squeeze in an entire season into such a short period of time. Around 50 different formats were put forward. There was also the question over which teams would take part in the inaugural professional season of independent Ukrainian football. The selected teams were based on their league positions in the 1991 Soviet campaign. The plan was to have six Ukrainian teams from the Top league, two from the First League, nine from the Western zone of the Second League, and the top two finishers from the Ukrainian zone of the Lower Second League (effectively the Ukrainian SSR championship) enter the Vyshcha Liha (top league). The remaining professional teams were split between the First League and Transitional League. For reasons unclear, the top two sides of the Ukrainian zone of the Lower Second League – Naftovyk Okhtyrka and Prykarpattya Ivano-Frankivsk, were granted Vyshcha Liha status ahead of Halychyna Drohobych and Vorskla Poltava, who finished bottom of the Second League western zone. The Second League was above the Lower Second League in the pyramid, as their names plainly suggest, so why the lower-ranked sides were given preference is questionable. Halychyna never did get a taste of top-flight football. This added up to only nineteen teams, one short of the planned twenty. The final spot was given to Temp Shepetivka, who finished ninth in the Ukrainian zone of the Lower Second League but won the Ukrainian SSR Cup. This was the tournament for Ukrainian teams too far removed from the upper echelons of Soviet football to compete in the Soviet Cup. By the time of its conclusion in November of 1991, it was renamed the Ukrainian Cup, so Temp can lay a dubious claim to be the first winners of the competition. Curiously, the idea of including the winner of the cup in the Vyshcha Liha came from none other than Ishtvan Sekech – the manager of Temp – two months before their decisive victory. Almost as if he knew in advance. The decided-upon format involved splitting up the 20 teams into two groups of ten. After a round-robin, home-and-away season, the two winners of each group would face each other in a final. All teams played an average of two matches every week in a rushed campaign played on a tight schedule. Then there was the matter of the cup. Back in the days of the UEFA Cup Winners’ Cup, the winner of each member nation’s domestic cup gained entry into the prestigious European competition. The cup schedule was therefore also condensed into just four months. All the cup matches were supposed to kick off on the same day – 16 February. But Bukovyna Chernivtsi already have plans to play a tournament abroad, so their first-round tie against Podilya Khmelnytskyi was brought up by six days. Instead of being played at Podilya’s home ground in the regional capital Khmelnytskyi, it instead took place in Ilnytsia in the Zakarpattia region. 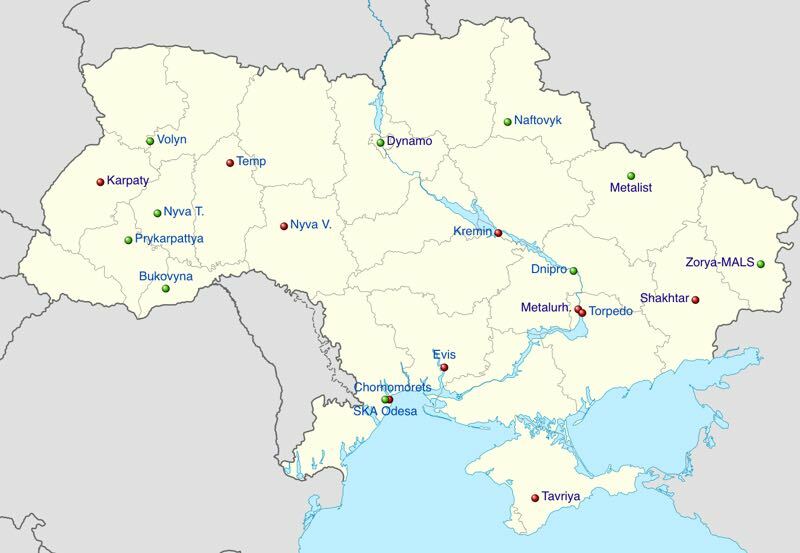 And so, Ukrainian domestic football was born on 10 February 1992, in the village of Ilnytsia, population 12,500. The transition to independence was a difficult one, and the economy struggled to adjust to a free-market system. Ukraine experienced soaring inflation and rapid output declines. In 1992 two currencies existed side-by-side, the Soviet ruble and the newly-established Ukrainian karbovanets. In this difficult economic environment, many clubs also struggled to survive and relied on unorthodox sources of income. SC Odesa received a grant from the regional finance committee to fund their entry into the 1992 Vyshcha Liha. One of Shakhtar Donetsk’s former coaches opened his own business and was expected to use the proceeds to help the club. Zorya Luhansk took a more traditional route – they received sponsorship from a Moscow firm and accordingly changed their name to Zorya-MALS. Dnipro received financial support from future Ukraine president Leonid Kuchma, then the head of the aerospace manufacturer Yuzhmash, but also sought alternative revenue streams. They spent $200,000 on a popcorn factory that was built in a former collective farm named ‘Path to Communism’ and sold the popcorn at matches. How profitable this venture actually ended up being is anyone’s guess. Dynamo were on more solid financial footing, as is to be expected. In 1988 the club received $2 million for the sale of Oleksandr Zavarov to Juventus, an incredible sum for the time. President Viktor Bezverkhyi had grandiose plans to build an indoor stadium with artificial turf by 1994. But Dynamo involved themselves in dozens of business ventures, including the sale of ICBM missile parts and a gold trading license, that ended up taking a financial toll on the club. By 1993, Dynamo were struggling to pay their players and provide basic equipment at their training base, and Bezverkhyi was forced out. In the cup final on 31 May in Kyiv, Chornomorets Odesa defeated Metalist Kharkiv in extra time thanks to an Ilia Tsymbalar goal and gained passage to the Cup Winners’ Cup. Back in the league, Dynamo easily won their group. Crimean side Tavriya Simferopol clinched their group two weeks later. Tavriya never sunk below second place in the table and from the fifth round did not relinquish the league lead. Dnipro and Shakhtar finished second in their respective groups and on 20 June met at the Metalurh Stadium in Zaporizhia to contest the third-place play-off. Dnipro won the match 3-2 to clinch the bronze medal. 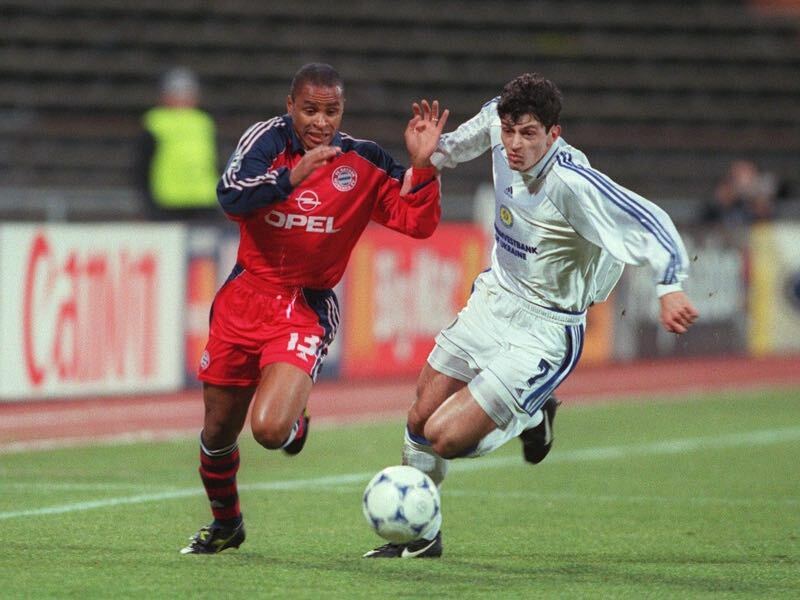 Among Shakhtar’s squad was a 17-year-old striker named Serhiy Rebrov. The following day Dynamo and Tavriya met in the decisive final in Lviv in front of 36,000 supporters to crown the first ever Ukrainian champions. Originally the final was supposed to be a two-legged affair, but the national team had already planned a trip to the United States, leaving no time for two matches. Dynamo were the overwhelming favourites. They won the 1990 Soviet Top league and finished fifth in 1991, second only to Chornomorets of the Ukrainian clubs. The capital club boasted an impressive squad that included a number of Ukrainian and Russian internationals such as Oleh Luzhny, Anatoliy Bezsmertniy, and Oleh Salenko. Tavriya, meanwhile, only managed a sixth-place finish in the 1991 First League, a full sixteen league positions below Dynamo in the pyramid. But despite lacking the star power of their opponents, Tavriya demonstrated their quality in the regular season, finishing above more established sides such as Shakhtar and Chornomorets. Tavriya were managed by Anataoliy Zayev, a colourful figure who referred to himself as ‘a player of local standing’ and spent most of his non-playing career in an administrative capacity rather than as a coach. They were led by captain and striker Serhiy Shevchenko, who scored eight goals during the regular season. Footage of the first half is missing, but by all accounts, Dynamo started strongly and pushed hard for the first goal. But the Crimeans resisted, and by the second half had seized the initiative. They registered the first shot on goal of the entire match in the 47thminute, when Shevchenko forced a routine save from Dynamo’s Lithuanian goalkeeper Valdemaras Martinkėnas. Tavriya shocked Dynamo in the 75th minute and took the lead through a Shevchenko header from a corner. Dynamo never recovered, and Tavriya became the inaugural champions of an independent Ukraine. They made their way around the stadium in a lap of honour with the Ukrainian flag while the shell-shocked Dynamo players looked on. Shevchenko, the hero of the match, received as his prize a $100 certificate and a brand-new television and vacuum cleaner. Tavriya were awarded the paltry sum of $800. Years later, Dynamo striker Oleh Salenko revealed some unsavoury details about the match. Tavriya were apparently offered a hefty bribe to ‘take it easy’ and let Dynamo win. Dynamo arrived in Lviv confident of the pre-arranged victory, already in a celebratory mood. But at half-time Salenko felt something was off. He approached the Tavriya players, who told him they had a change of heart. “In the second half, it became clear that Tavriya were fighting to the death,” Salenko said in a 2014 interview. Tavriya turned down a lucrative pay-off but seized their chance at glory. After all, how often would they have such an opportunity? Salenko is confident that had the Dynamo players prepared seriously they would have easily beaten Tavriya. But they chose a different route and were justifiably punished. Every Dynamo player was fined $2,000. Not for attempted match-fixing, but for losing – the fine came from the club’s management. Dynamo would go on to win the next nine league titles, their hegemony unchallenged until the emergence of Shakhtar as a serious rival in the early 2000s. They were also regulars on the European stage and in 1999 came agonisingly close to a spot in the Champions League final. Tavriya entered the first ever edition of the Champions League in the 1992/93 season in the preliminary round and defeated Irish champions Shelbourne 2-1 on aggregate. In the first-round proper, they were eliminated 7-2 on aggregate by Swiss side Sion. They returned to European competition only in the 2008 Intertoto Cup. While Tavriya were never relegated, they also never won another trophy and in 2014 were dissolved following the Russian annexation of the Crimean peninsula. However, Tavriya were re-established in 2016 and currently play in the Ukrainian Second League. They are based in Beryslav in the Kherson region, one of many Ukrainian teams currently in exile. Their currently plight is a far cry from their 1992 glory. But they will always be known as the first Ukrainian champions.